Are solar panels on ground level for above ground pools leaky? I used a pair of 20x4 Fafco solar panels last year. They were mounted on the pool deck above the water line. This year we have a new pool and deck which is too small for the panels. Was wondering if they are below the water line they will leak continuously when the pump is not running. I think they have a valve to release water when not in use. The manual says that they are acceptable for AGP on the ground, but I'm distrustful. If they do leak I was thinking about running the supply and return lines for a small stretch above the water line and then back down. But that would be up and down 4 feet both before and after the run. Is it worth worrying about the leak and if so will the up / down cause pressure loss? It's a 1hp pump and the run to the panels will have about a 20 foot horizontal run including a 90 degree turn. Properly maintained panels should not leak. But, if your panels leaked last year when the pump was running, then, obviously, they are going to leak when mounted below the water line of the pool. 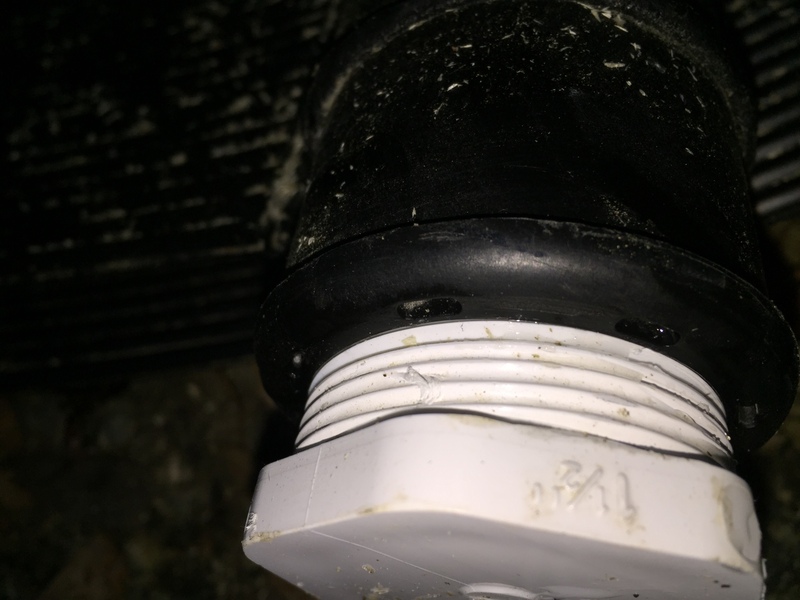 When mounted below the waterline, the vacuum breaker (the "valve to release water" that you mentioned) is not necessary and will likely be a a source of potential leaks. I don't see why they would "leak" if you put them on the ground. Their installation manual shows a picture of the panels on the ground. It sounds like you are worried about a leaky drain valve. That's a functioning of the quality of the valve, not where it is located. Putting an above the waterline loop in the system won't change any of that potential for the system draining out of the drain valve. The siphon effect will drain the water either way. For all practical purposes your pump won't notice the difference with the extra bit of piping. The pump only sees the line resistance losses. There really isn't any net head increase on your pump due to the vertical height as long as both sides have water in them. I think they have a valve to release water when not in use. Are you talking about a vacuum release valve (VRV)? If the panel is elevated, this valve will open when the pump turns off so the panels can drain. However, panels that are plumbed at or below water level will not drain and will remain full and the VRV will remain closed. If the pump shuts off during the day, the water left in the panels will continue to heat up. Yes - that's what I was thinking about. They did not leak much if at all when the pump was running but once I turned the pump off the water would drain out as expected / designed. I'm worried about that end of cycle leak being continuous when below level. I don't see how I could stop that valve from functioning and having a continuous flow out. It's built into the permanent part of the panel. See the little holes in the black part below. At least I assume that's where the valve is. A VRV is designed to be a one way valve. Let's air in but not water out. If the panels are below water level, there will always be water pressure keeping it closed. Ok - that makes sense now. They behave differently when there is active pressure from weight of the water that I didn't have when elevated. This certainly simplifies my plumbing plan. Solar panels needs to be specific for tile roof?